Back in October last year, in the wake of multiple Pixel 2/2 XL issues, Google extended the manufacturer warranty for both flagships from one to two years. But the length of the Preferred Care program remained unchanged (one year), effectively making the extended coverage useless. That's, however, changing now. 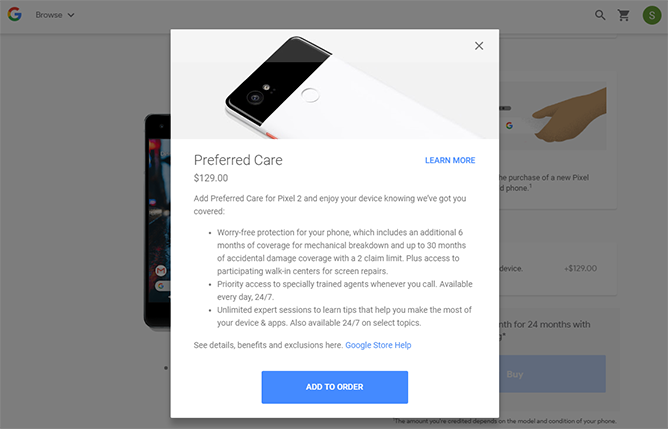 The Preferred Care coverage for both Pixel 2 and 2XL has been extended by 6 months. This means now users have a total of 30 months of accidental damage coverage, effective when the device is purchased. Those already using the Pixel 2 series have started receiving notifications informing them about this change. For those who aren't aware, Pixel 2 Preferred Care coverage also includes 6 months of mechanical breakdown coverage, which is effective after the two-year manufacturer’s warranty. 2 year warranty is the minimum in the european union, for every new product. 1 year is just to short imo. Glad some rules are better here.